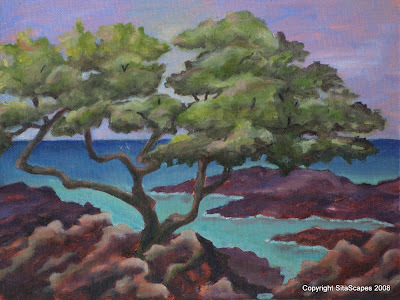 Artists Comments: My eye was captured by the striking contrast between the slim tree limbs in shadow against the striking variations in the ocean hues. I found myself painting the tree to how my mind though I should paint a tree. When I took a step back from the canvas I realized that I was in fact not painting what I was looking at but instead what I thought it should look like. I was able to re-adjust my translation of the tree to what was more realistic to its true form. I then experimented with enhancing the color of the lava to make it more interesting. Not painting with black really helped me with this experimentation of color.